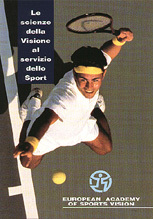 Sports Vision is a multidisciplinary, functional approach with the aim of conducting the entire visual system into functioning at the top of its performance according to the relative activity practiced. The visual improvement ca be addressed both at general aspects of vision (comfort, elimination of asthenopia, efficiency, etc. ), and at specific aspects characterizing the primary needs of a person. Sports Vision owes its wide diagnostic and rieducational perspective to the fact that it originates from a large number of studies conducted in various scientific fields: optometry, psychology, ophthalmology, biomechanics, physiology, neurology, etc. It is the application in sport that has given impulse, in the sixties, to this type of approach also in the civil field, although applications in sectors different from sport were already in use. Sports Vision is based upon the fact that the best part of our daily activities ar characterized by visual perception and thanks to the visual feedback we receive from the environment we know how to move and act in an efficient and purposeful way. Each visual and visuo-motory activity performed by a human being is characterized by more or less specific visual needs and the ability to relate with such needs depends greatly upon how we are used and trained into utilizing our visual system. "The missing link in the mosaic of performance".